Richard Schwend, M.D., professor of orthopaedics and pediatrics, received the Walter P. Blount Humanitarian Award from the Scoliosis Research Society. Richard Schwend, M.D., professor of orthopaedics and pediatrics, was recently honored with the Walter P. Blount Humanitarian Award by the Scoliosis Research Society. The award recognizes outstanding service to patients with spinal deformities and generosity to the profession of scoliosis research. 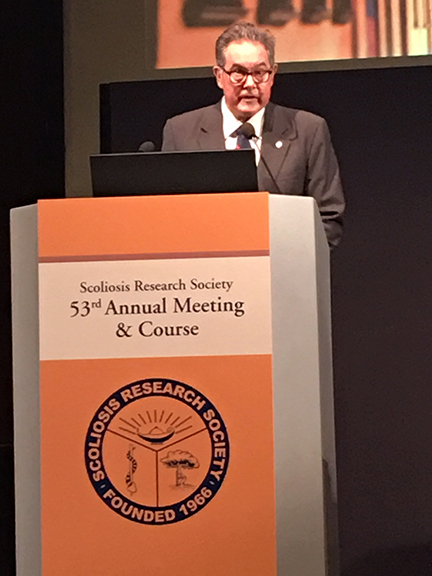 It was presented during the 53rd annual Scoliosis Research Society Annual Meeting in Bologna, Italy, in October. 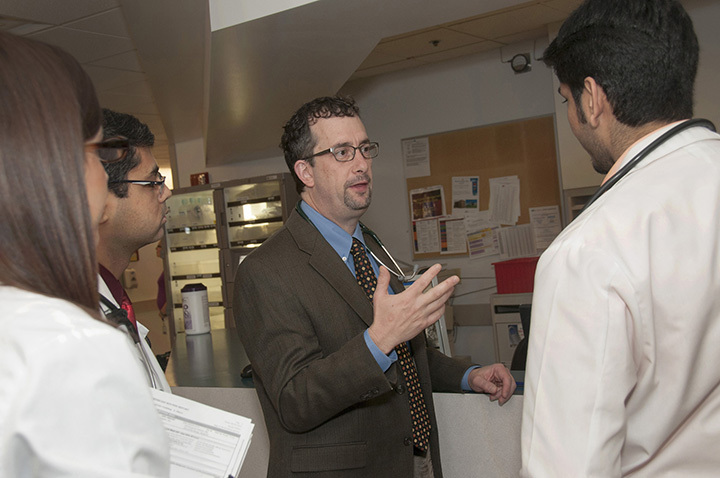 Schwend serves as chief of orthopaedic research at Children’s Mercy Hospital, one of the UMKC School of Medicine’s partner teaching hospitals. He recently completed the Global Clinical Research Training Research Program at Harvard University. For the past 18 years, Schwend has been active in a humanitarian effort in Ecuador for children with spinal deformities. He also serves as the medical director for Project Perfect World, Ecuador, a program that sponsors the Ecuador Spine Project. The immediate past president of the Pediatric Orthopaedic Society of North America, Schwend received the organization’s Humanitarian Award in 2014 and its Special Effort award in 2013. He also served as chair of the Orthopaedic Section of the American Academy of Pediatrics from 2010-2014 and created a scholarship program to provide residents with international global experiences. 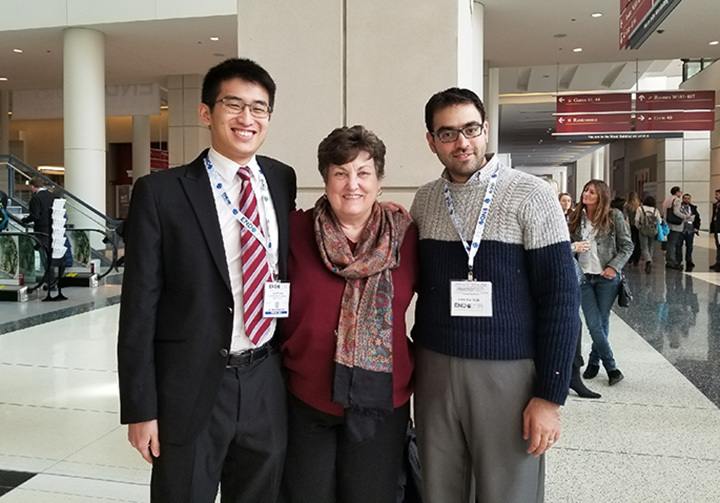 Yicheng Bao, left, with his research study co-authors, Dr Janet McGill, professor of medicine at Washington University-St. Louis, and Dr. Maamoun Salam, a graduating endocrinology fellow at Washington University. Yicheng Bao, a third-year medical student at the UMKC School of Medicine, conducted a research study that shows adults diagnosed with type 1 diabetes are at greater risk of developing additional autoimmune conditions. 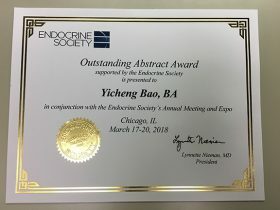 Bao received an Endocrine Society Outstanding Abstract Award for his work. He was then invited to give an oral presentation of his results at the March annual meeting of the Endocrine Society in Chicago. This was a special and rare opportunity, as most selected abstracts are designated for poster presentations. Much of Bao’s research took place during his summer medical student research program at Washington University in St. Louis. The program was sponsored by the National Institute of Diabetes and Digestive and Kidney Diseases (NIDDK). Bao continued working on the study when he returned to school at UMKC. Following his presentation in Chicago, Bao’s results have been reported in a number of health-care and diabetes-related media outlets. His study found that people with type 1 diabetes can develop multiple autoimmune diseases. And, those diagnosed with type 1 diabetes as an adult run a greater risk of developing them. Bao’s study collected patient data on 29 autoimmune conditions. 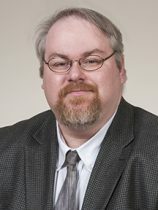 He found that the overwhelming majority of additional conditions developed in adults after being diagnosed with type 1 diabetes. These results of could lead health-care providers to give closer attention to symptoms of autoimmune diseases in diabetes patients diagnosed with the disease as an adult. Bao said he developed skills from the experience that have lead him to continue his research efforts. He now intends to pursue a career in academic medicine and research.